(From left:) Mikey Cafarelli (Rep. Joseph Cannon), Miranda Medugno (Helen Keller), Sarah Anne Sillers (Anne Sullivan), Emily Stemper (Laura Redden Searing). Photo by C. Stanley Photography. 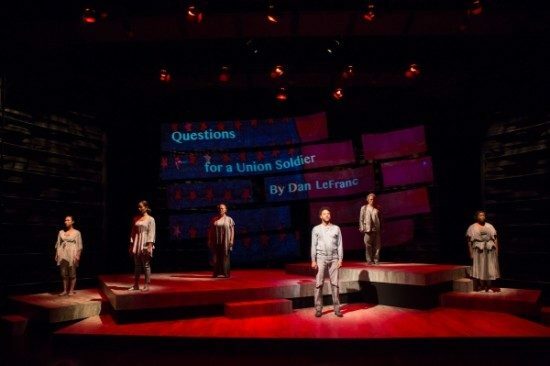 Mary Resing’s world premier production of Visible Language currently performing at Gallaudet University’s Eastman Studio Theatre presents a series of historical events within a neighborhood district, now occupied by Gallaudet University. The provocative conflict and clash of values between Edward Miner Gallaudet who viewed sign language as a primary means to communicate among individuals who are deaf and hard of hearing, and Alexander Graham Bell, who actively believed in a more global approach, (incorporating sign language into orally communicated methods of speech) in communication is one that affected the lives of all individuals impacted within the American Deaf Culture. Despite several of the production’s minor technicalities, Artistic Director of Avant Bard and Director of Visible Language was wise in taking on such a bold and daring project. Communication is key and essential as presented in this musical highly recommended for all theatre patrons everywhere. For starters, I have to say thank goodness for the presented captions throughout the course of the production, otherwise I would’ve been lost with the overall lack of volume/energy in sound balance between the vocals and the orchestra. With the acoustics of the spacing, the use of microphones might be suggested for the actors to heighten the sound dynamic and match the volume levels of the orchestra pit. If the cues had been picked up by some of the performers throughout the show, there would have been a lot of clearing of dead space in certain integral scenes, which would have picked up the overall pacing of the flow and timing of the show. Again, the lack of structured pacing in sound cues could have been due to some technicality imbalances. At certain moments in the show, I noticed some indicating with a few actors when I was hoping for more solid connections made between scene partners on stage, but on the whole there were many beautifully highlighted moments. Beginning at the top of the show, the ensemble’s focused facial expressions match the underlying tones and themes of the presented ASL language. Alexander Graham Bell, (Harv Lester)’s energy and sense of comedic timing is highly focused and on point right from the moment he sets foot on stage and begins his dialogue with ASL. Lester has a wonderful sense of making and establishing stage connections with his scene partners throughout any given moment in the show. From the time Bell delivers a powerful speech on a new visible language system to be taught incorporating articulation instruction for all students including those who have hearing and visual impairments, to a light-hearted and hilariously complex presentation of demonstrating placement of the articulators within the mouth structure, to a very realistic and accurate lesson given to Helen Keller (Miranda Medugno) in the kinesthetic/physical instruction in articulation and phonetics, Lester carries himself beautifully as the mastered speaker and instructor. It is astounding to hear his impeccable diction as he presents the biomechanical and physical instruction of the oral motor structures in the mouth and voice when introducing specific vowels and consonant sounds. Kari Ginsburg is a breath of colorful fresh air as Bell’s wife, Mabel Bell. Bell’s elegance and poise is naturally accentuated by Ginsburg’s charm every time she appears on the stage. Another solid moment is the interaction between Representative Samuel Randall, (Lewis Freeman) and the board members as he drives his ambitions for advocating in funding of trades vs. education. As a contradiction to Randall’s opposing views, Bell later in the show delivers an empowering speech advocating the need for funding of education. Bell’s envisioned practice of breaking speech down into simple sound patterns in educating individuals who are deaf to vocalize as opposed to solely relying on the communication system of signing, was not only thought to be a new and enhanced way of communicating, he believed it to be an absolute functional life necessity. Elisa Rosman delivers strong, high-energy music direction throughout the entire show, and allows for strong mezzo-soprano vocalists like Sarah Anne Sillers to display her beautiful vibrato on stage. 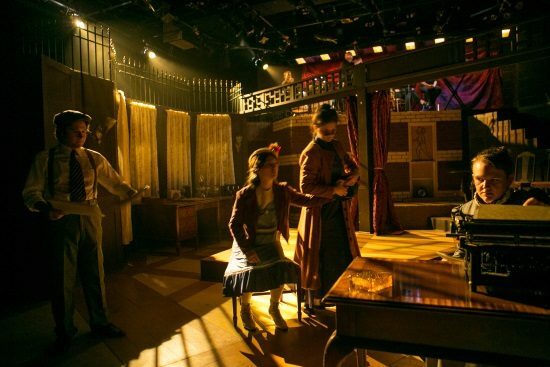 While Elizabeth Ennis does a fine job in featuring the actors in elegantly crafted, and era-appropriate costumes, there were moments when I was concerned about the safety of some of the actors in their lack of ability to move freely when on the stage. Altogether, Visible Language is a groundbreaking historical musical emphasizing the need for communication as everyone has a voice in any way that can be expressed or heard no matter the background. Communication is key and essential as presented in this musical highly recommended for all theatre patrons everywhere. Running Time: Approximately 1 hr. and 50 minutes with no intermission. Visible Language runs through November 16, 2014 at Eastman Studio Theatre in the Elstad Annex at Gallaudet University. 800 Florida Ave NE, Washington DC, 20002. For tickets, click here.